The Effect: The stage is bare but for a rectangular board that is supported on either end by a chair. The magician selects a female from the audience at random. On stage she lies on the table with her head supported by a pillow. A sheet is draped over her, leaving only her head and feet exposed. After a wave of the magician’s wand, the table slowly rises. Another wave of the magician’s wand and the table slowly rotates 360 degrees. Then, with a third wave of the wand, the table slowly levitates downward until it again rests on the two chairs. The sheet is pulled off of the volunteer and she stands, apparently unharmed by the experience. The Secret: Much of your success of this trick rests on preparation. The table on which the volunteer will lie should be made of plywood at least one inch thick and you must cut it exactly two feet by six feet. You should then tack a layer of soft foam cushioning upon it, after which you should cover it with either vinyl or leather. The two chairs need to be sturdy and capable of bearing the weight of the table and a volunteer. You must position the chairs on stage so they do not tip over when weight is applied and yet they do not interfere with the upward movement of the table during the execution of the trick. The volunteer is not truly selected at random. It is best to have someone under 5’5” and less than 130 lbs. Otherwise, there is a danger of the table sagging or -- worse -- the volunteer rolling off. As the volunteer lies down, you should steady the table and chairs. Once the sheet is over the volunteer’s body, the remainder is simple. Your flourishes with the wand are for effect only (and you should feel free to add other gestures that may further enhance the mood). To levitate the table upward, use your telekinetic powers to grasp the table, lift it directly upward, and then slowly rotate it around. After appropriate “oohs” and “aahs” from the audience, lower the table. That’s it! Help the volunteer off the table and then bask in the sustained applause. 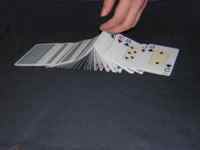 The Effect: The magician takes a deck of cards from his pocket and invites two volunteers up to the stage. He cuts the deck in two, hands each volunteer one-half, and asks each to examine the cards and count them. The two numbers add to 52, proving it is a regular deck. The magician then spreads the cards facedown on the table, turns around and asks the volunteers to select one, show it to the audience, and then place it off to the side facedown by itself. The magcician turns back, gathers the rest of the deck, and stacks it directly on top of the selected card. He then asks the volunteers to take turns shuffling the deck. When done, the deck is placed back down. The magician covers the deck with his hands, mutters an incantation, removes his hands with a flourish and asks the volunteers to find their card. They cannot. He then asks them to count the cards. They add to 51. He then directs the volunteers back to their seats. Then, almost as an afterthought, he asks one of the volunteers to reach under his seat. There, on the floor, is a playing card. He asks the volunteer to show the card to the audience. It is, in fact, the missing card. The Secret: Minimal preparation is required for this trick. Rather, its success lies in its timing. The deck is in fact an ordinary deck and no rigging is necessary.You execute the trick as described. However, once the card is chosen and immediately after you place the remainder of the deck on top of it, you must then act quickly. This is the only time when you will know precisely where the chosen card is. At that exact moment, teleport the card to the floor underneath one of the volunteer’s chairs (it usually shouldn’t matter which one, unless one is particularly exposed to the audience’s view -- you don’t want audience members noticing the card until the trick’s denouement). Then, pick up the deck and give it a quick cut before handing it to the volunteers to be shuffled. That way, they will not be able to see that the bottom card (which should be their selected card) is no longer there. Proceed with the remainder of the trick as described. If done correctly, the trick is baffling and will provoke cries of amazement. The Effect: This is truly one of the most startling tricks ever developed for the stage. A volunteer comes to the stage and steps into a wooden “coffin.” The door on its surface is shut and the magician then takes out five swords, which he invites three members of the audience to come on stage and inspect. He then takes the swords, asks the volunteers to identify where he should shove the sword in and then does so, in exactly the spot indicated, with the end of the sword coming out on the other side. As he does so, we hear muffled cries from within the box and blood drips on stage from the box. The magician then asks the three volunteers to help pull out the swords. He then opens the door. The volunteer within the “coffin” emerges unscathed and unbloodied. The Secret: You should construct the coffin-like box with thin plywood; the door should swing easily on a set of three hinges. It should have a wooden top but no bottom, so as to allow “blood” to flow out. In addition, the magician needs to have secreted offstage a tape recorder on which he has previously recorded -- five times -- gasps or cries of pain. The swords can be purchased from any fencing supply store and the ends need to be sharpened to ensure easy penetration. Finally, the magician needs to have secreted in a false panel of the box a bag of blood. This can be purchased from any blood bank. Execution of the deck requires great skill. As you plunge each sword into the box, you need to shift the portion of the sword that is inside the box into another dimension (which dimension is of your choosing) and then, as the end of the sword emerges from the box, shift that portion back into your own dimension. As the first or second sword is shoved in, direct its course so that it pierces the bag of blood. As it leaks, it will create the illusion that the volunteer inside is “bleeding.” Finally, as each sword is plunged into the box, use your mental powers to press “play” on the tape recorder, so that one of the prerecorded gasps or cries is heard. Make sure to mentally press “pause” after each one, so that you have one sound effect for each sword that is used. 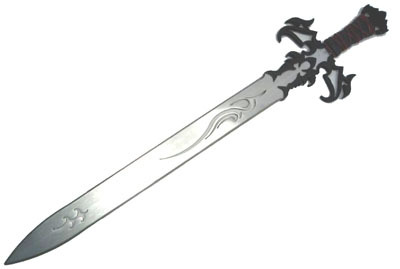 Finally, as the volunteers remove the swords, bring each portion of the sword back into your own dimensional space as it is being pulled from the box. This requires practice, since if your timing is off you may rematerialize the sword too late (thereby destroying the illusion that the sword itself is solid) or, too early (in which case the sword could rematerialize inside the volunteer's body, creating severe injury). The effort involved in this trick is considerable, but is worth it. Oftentimes at its conclusion audiences will stand in applause, and hence it is recommended this be the closing trick of your act. Be sure to purchase the other books in the series “Secrets of the Magicians” by Giuseppe Alberto, including Volume 2 (“Telepathic Magic Tricks”) and Volume 3 (“Psychic Magic Tricks”).